Danny Thomas* was a young entertainer struggling to make a living in the field in Detroit, USA. Over the years, he prayed for Saint Jude Thaddeus** and promised to build a shrine for the saint one day. From a struggling entertainer to a well-known national entertainer, Danny Thomas shined in the industry and kept his pledge for Saint Jude, and this is how Saint Jude’s Children’s Research Hospital saw the light. 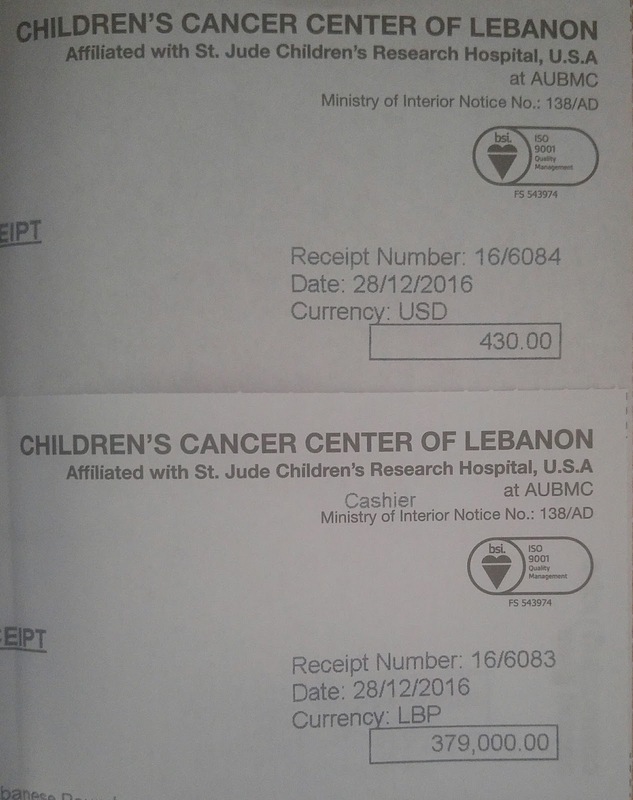 Known today as the Children Cancer Center of Lebanon (CCCL), the center was founded in 2002 following an agreement between the Saint Jude’s Children’s Research Hospital and the Children’s Cancer Center of Lebanon Foundation and the American University of Beirut Medical Center. The center was inaugurated in April 2002 and works in full affiliation with the Saint Jude’s Children’s Research Hospital. Almost 15 years later, the center still operates to support and treat all children fighting cancer, using the latest medical treatments, the most sophisticated psychosocial services and ensuring a proper understanding and awareness of the disease. I have read what I stated above in a more developed manner on the CCCL website over and over again onhttp://www.cccl.org.lb/ and I have followed-up distantly on the center’s work especially after the donation my friends and colleagues collaborated in making last year (http://maya-yared.blogspot.com/2016/01/every-dollar-counts-december-2015.html), but it was only until my visit to the center last December that I really felt involved in the cause. I have met with a member of the fundraising team who guided me through the donation process (raised this year again via piggy bank, just like last year) and explained to me a bit about the center (they even let me visit the outpatient division! ), and I was mainly touched by the confidentiality and respect they have to the cases they treat, the fighters (that’s what I like to call any patient suffering from cancer), and even the donors identities! I was also happy to hear a confirmation that all the fighters treated at the CCCL are treated for free regardless of their age (as long as they are under 18 years old), their religion, their race or their nationality. Furthermore, when I asked about the hair donation process (a process that I hope to be able to undergo next year), I was happy to hear that the fighters at the CCCL do not wear wigs; this has ensured the amazing psychological follow-up done at the center and it says a lot about those fighters who have embraced their cases and now believe in themselves as fighters (soon to be survivors) rather than feeling weak and seeking to hide and suffer in silence. 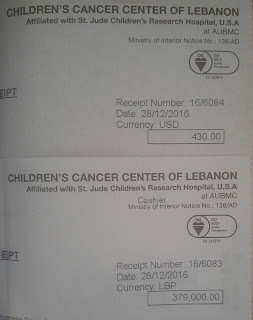 A total of 1,024,000lbp (One Million and Twenty Four Thousand Lebanese Pounds) was raised this year (receipts attached to this post) and I left the center with a mixed feelings of hope and pain. My son (Stephen) who insisted on accompanying me to the center (and even donated from the money he had in his own piggy bank) asked a lot about the medical process at the center which was explained to him in a manner suitable for his age. He put tears in my eyes as we left when he said “You know mom, we are lucky that we are not sick but it is good that the sick people have someone to help them, take care of them, treat them and plus they are at a nice hospital not one with white boring walls” (he was referring to the children-friendly décor that surrounded the place. Raising my prayers to find a cure for cancer…. and on this note I leave you. Bring my 33rd year on!